Ohio is reaping what it has sown. They have protected and promoted jihadis for several years. 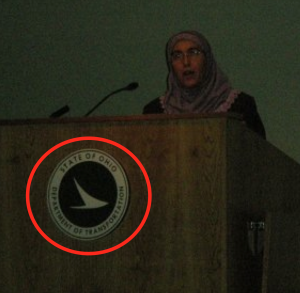 In 2009, the Ohio Department of Homeland Security hosted a day-long seminar which included senior Hamas/Muslim Brotherhood officials, including Hani Sakr, a member of the U.S. MB’s Board of Directors, and the leader of Hamas in Ohio, Asma Uddin. In 2010, the Strategic Engagement Group (predecessor to UTT) conducted a 3-day training program at the Columbus (Ohio) Police Department. 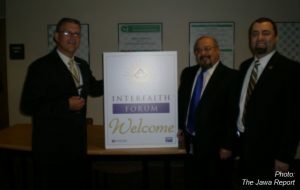 At the end of the program, the Ohio DHS Director Bill Vedra, the Chief of the Columbus Police Department, and others came into the room and defended Hamas (doing business and CAIR), the outreach programs to the Muslim community, and commented negatively about the 3-day program even though none of them sat through one minute of the training. Several of the officers in the room stood up and confronted the leadership, calling them out. 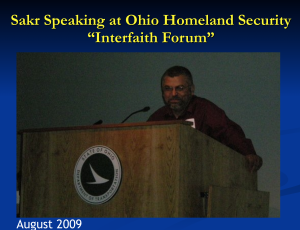 One of the people Ohio DHS Director Vedra defended was Omar Alomari, a Jordanian who was later fired from Ohio DHS. Alomari produced a pamphlet for Ohio DHS which listed organizations they worked with including Hamas (dba CAIR), Islamic Society of North America (ISNA), Islamic Circle of North America (ICNA), Muslim Alliance of North America (MANA), Muslim American Society (MAS), Muslim Public Affairs Council (MPAC), and the Muslim Students Association (MSA) – all Hamas/Muslim Brotherhood organizations. After this was made public in articles by The Jawa Report, Ohio DHS tried to secretly destroy all the pamphlets. In February 2016, Somali Mohamed Barry walked into the Nazareth Restaurant in Columbus, Ohio with a machete screaming “allah u akbar” and began attacking customers. He injured four people and was later shot dead by police. The restaurant is owned by an Israeli. CNN is still searching for a motive. Is it possible the entire effort by the jihadi Movement in Ohio – and everywhere else across the nation – was/is to get the leadership of the police and FBI to place their trust in the Muslim leaders to “help” them “understand” acts of “terrorism” in a way that never points back to jihad, Islam and sharia? This week, after yet another jihadi attack in Ohio, the response was the same. Until law enforcement decides to prosecute and lock up terrorists instead of befriending them and allowing them to train their departments, this nonsense will not end. Citizens must stand firm and hold elected officials, police chiefs and state homeland security officials feet to the fire, and ensure they are trained by UTT, not by Hamas and Muslim Brotherhood leaders. Get them a copy of Raising a Jihadi Generation for Christmas. In 2014, John Kasich of Ohio was the only member present at the Republican Governor’s conference in Florida to openly express a willingness to create a pathway to American citizenship for UNDOCUMENTED immigrants. Furthermore, since polygamy became illegal in the United States when President Lincoln signed into law the 1862 “Morrill-Anti Bigamy Act”, thus cannot be justified under the rubric of ANY “religion” as American Mormons learned (to their chagrin), had it been otherwise, the tyrant leaders of Communism, Marxism, Leninism, Naziism and Japanese Imperialism, to name but a few, in order to thwart opposition, would obviously have referred to their respective movements too, as a “religion”. Polygamy among Muslims, however, is not only legal, but encouraged worldwide to facilitate the tactic known in Islam as “outbreeding” with respect to all other societies (particularly those in the West); actually, for one’s multiple wives to have fewer than five children each, according to Islam, is a stigma. Thus their birthrate triples every two decades. And in the United States, notwithstanding the illegality of having multiple wives, Muslims – and only Muslims – are exempted from said limitation in the name of (you guessed it) “RELIGION”. 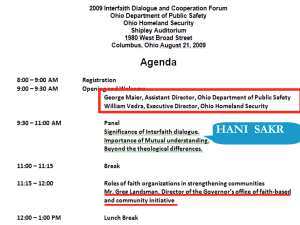 Thus, contextually, the Ohio Department of Homeland Security’s so-called “2009 ‘INTERFAITH’ Dialogue and Cooperation Forum” was in truth nothing more than a garden-variety Muslim Brotherhood scam based on “religion” (as usual) to deepen the coma Ohio law-enforcement entities were ostensibly already in with respect to the most fundamental truths about the Global Islamic Movement’s relentless attempt to supplant the Constitution with the draconian Islamic hell known as “sharia”. In spite of the foregoing, however, there would appear to be a proverbial “light at the end of the tunnel” with respect to federal indictments involving law-enforcement officials et al who may have demonstrably crossed the Rubicon of simply flirting with treason on behalf of the enemy in an ongoing war of survival, by effectively joining forces with said savages and becoming sub-rosa quislings. I.e. a new day does seem to be dawning. Too, since “politics” are but a combination of power & money, and Muslim Brotherhood operatives have demonstrated access to as much as they need of the latter to buy influence at the very apex of American power, middle-east money may have inadvertently caused the unprecedented defiance “sanctuary cities” officials et al (at all levels) have been using to prevent the Department of Justice from protecting the country. As to the group of individuals that emerged to critique a 2010 three day training presentation conducted by UTT’s predecessor, the “Strategic Engagement Group”, without having actually attended the sessions, and which included the Ohio Director of Homeland Security & the Chief of the Columbus, Ohio PD, they must have been malleable misfits under the influence of instructions from the federal government which had been relayed to an Ohio official, possibly the governor, to ensure that the view of a White House which was on the side of Islam, would be maintained with a single opinion per the rehearsed content of collusion.